Pinkadots Elementary : Easy Bulletin Boards & a MUST HAVE Giveaway! Easy Bulletin Boards & a MUST HAVE Giveaway! I'm so excited to show off my new hallway bulletin board! 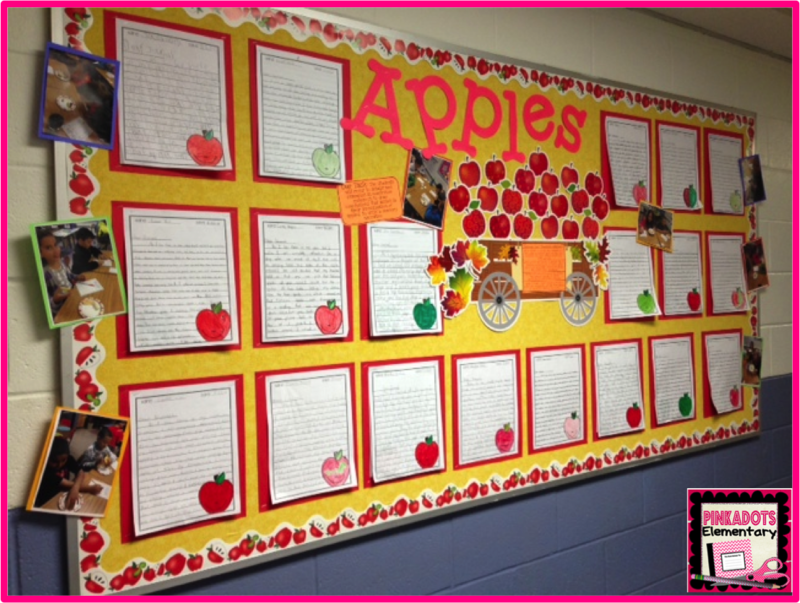 We just finished our first writing piece with our Apples, Apples, Everywhere unit. Have you checked this out yet? We've updated the unit multiple times this week as we used it in the classroom! It will surely be one of your students favorite lessons! On Friday's post, I will post some pictures of student work. For their first writing assignment of the year, I am SUPER impressed! They have already improved tremendously from their first draft! It really paid to go slowly through the writing process! Check out my finished bulletin board! Seriously, this might be one of my FAVORITE bulletin boards ever for many reasons. 1. I used my new cricut to cut the beautiful title letters out. 2. I absolutely love the pictures of the students taste testing different types of apples. 3. I added the standards addressed and the objective of the unit to the bulletin board. 4. Our writing has improved drastically in ONE MONTH! 5. I now own bulletin board decor for the WHOLE year from the Creative Teaching Press! Seriously, do you know how awesome this is? I stapled up three yards of bright fabric and plopped on the first fall set. I used our current student work (Apples) and LOVE the results. As if that wasn't easy enough, the monthly packages come with suggested bulletin board activities and even writing paper to copy and use! The main picture stays up for three months and the picture details can interchange as the months change. Having a monthly bulletin board planned and pre-prepped for the year actually makes me excited to change it! I am thrilled to announce that the sweet people at The Creative Teach Press have graciously offered to send a super lucky winner each bulletin board set above! Simply fill out the Rafflecopter below and cross your fingers and toes! I will notify the lucky winner Sunday night! I love anything easy that I can keep up for a while!! I love easy and displaying children made projects. LOVE the fall essentials pack... Those apples are adorable!! I love the hallway bulletin boards! I love bulletin boards that POP! I love to see kids' work displayed.